Those familiar with the Churchill Tank will understand that this vehicle was very much an Infantry support tank, with a slow speed and thick armour the role of the Churchill was a supporting arm to assist the infantry on to a position. Thus unlike faster Cruiser Tank Regiments that were formed into Armoured Brigades normally in Armoured Divisions, Infantry Tank Regiments or Battalions if you prefer were grouped in independent Army Tank Brigades with no Divisional Associations. 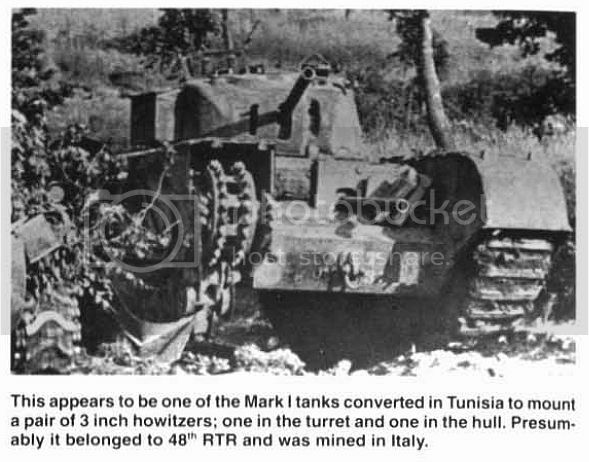 The story of the Mk I CS stems from the decision in December 1942 to send Infantry Tank Brigades for specific operations in Tunisia and would prove the first real in theatre test for the Churchill. One of the Brigades sent to Tunisia was 25th Army Tank Brigade consisting of the North Irish Horse, 51st Tank Regiment and 142nd Tank Regiment. In March 1943 a second Tank Brigade 21st Army Tank Brigade was sent to join the forces already in Tunisia. They landed on 25th March 1942 and consisted of 12th Royal Tank Regiment, 48th Royal Tank Regiment and 145th Regiment Royal Armoured Corps. As early as March 1943, 25th Army Tank Brigade were reporting back on the performance of the Churchill and amongst many recommendations was a strong case being made for more close support tanks and the recognition that the location of the 3 inch howitzer in the front of the hull was far from ideal. All three makes of Churchill seem to have been deployed in North Africa, the Mk I, Mk II and Mk III versions. The Mk I Churchill CS was a spin off of the experience in North Africa. Only small numbers of tanks were converted and this conversion saw the switch of the 37mm anti tank gun to the hull position and the 3 inch howitzer to the turret position thus allowing all round HE and Smoke fire support. Inside the Armour have produced a complete package to build the Mk I CS version, but with hull and turret mounted 3 inch howitzers representing 'BUSHMILLS' B Squadron, North Irish Horse, 21st Tank brigade, which should make for an interesting option. (see photo below). Inside the Armour have provided a complete kit to allow modellers the opportunity to build the Mk I CS Version. The kit came packed in a large sturdy box, much larger than I expected. It consists of 4 main build parts; one: an AFV Club Churchill Mk III kit, minus the AFV Club Decals, turret and turned barrel, two: an Inside the Armour resin conversion set to make the Mk I CS version, three: a set of Heavy Cast Track and four: a detailed set of marking for 9 different vehicles. 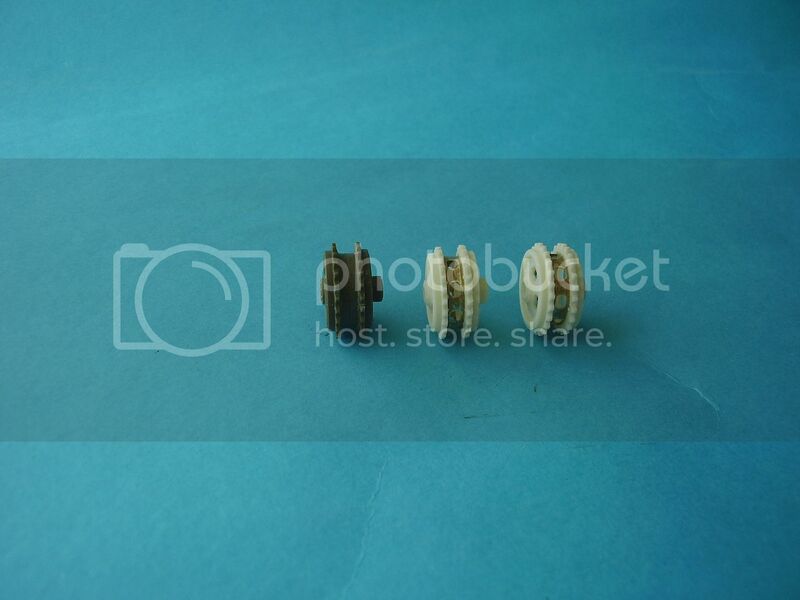 Additionally 3 small frets of PE are provided for the front idler wheels and the main kit. The AFV Club Churchill Mk III, kit No AF 35153 has already been reviewed here on site and across the web so I see no point in covering already well trodden ground. It is quite simply a terrific kit. For instructions Inside the Armour have switched form CD disc presentation to an A4 size landscape document format. Consisting of 13 pages some of which are in colour the booklet lays out the construction in a pictorial diagram format. A read of page 2 is necessary to distinguish the different markings for the AFV Club and Inside the Armour parts. Page 3 gives you some important reading before commencing working with resin and PE parts. Colour photographs of the Inside the Armour and AFV Club parts are contained on pages 4 and 5, As with any build a study of the instructions, identification of what goes where and choosing your references towards a specific build are recommended. My only observation on the instructions, is that the kit parts come on the colour sheet showing the Inside the Armour parts. It may be my poor eye sight but I found identifying the cream coloured resin parts difficult given the background of the picture. The tracks provided are also from AFV; kit No AF 35183, being B.T.S 3 Heavy Cast Steel Track often found on the earlier style of Churchill. These are individual track links and look very nicely detailed and appear to have a reasonable easy construction process. 73 links are required per side and the set provides enough for 150 links. In order for a flush fit you will need to trim off any raised pin marks inside the individual parts. As mentioned in the Introduction Inside the Armour have provided the conversion set for the more unusual twin 3 inch Howitzer Close Support Tank, examples of which served with the North Irish Horse and 48th Royal Tank Regiment. Should you want the more conventional version then a switch of fire power in the Mk I kit would be all you need. 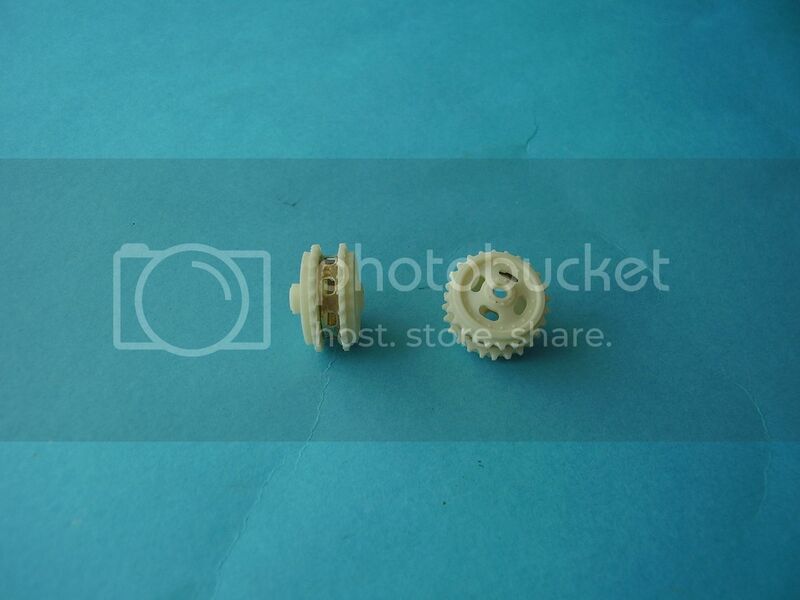 The parts are cast in a light grey and cream coloured resin. There are about 42 of them in total. The turret is the earlier cast steel type and I believe based on the moulds Inside the Armour acquired from Cromwell models. The detail is excellent but the top of the turret is cast very thinly, and in order to strengthen it up I added a small skin of miliput. There was quite a bit of spillage on the underside of the turret that needed clean up and a few air bubbles on this lower side too. The turret ring comes with a seat and part radio fitted and once the clean up was done on the underside fitted the main turret nicely. To add to the turret you get two nice bins or blanket boxes if you prefer. You get two styles of cupola the standard option and a nice Panzer III type that was fitted to ‘BUSHMILLS’ of the North Irish Horse. You also get appropriate hatches for the Panzer III Cupola and the other turret hatchs. You get two 3 inch howitzer barrels, that have drilled out ends. One of mine had a nasty air hole in the firing end that needed filled with CA glue. To go with the barrels you get two pretty basic howitzer breech blocks. You get the correct style of rear hull exhaust and replacement rear side ends for the early style of tanks. There is a spare fuel container and two resin supports that look delicate but one of my supports was missing (see below re customer service). Also included in the kit are a set of resin idlers and the correct central ring made out of PE. There was some overspill on a couple of the idler wheels that took a fair bit of work to cut out and clean up. There is quite a lot of flash to remove from the spokes but use of a soft file should make that a simple job. I reviewed a set of these as a separate item and there were no issues with that set. You get two end mudguards for the tank, one of mine was slightly bent at the edge but some hot water straightened it out without any problem. The remaining parts consist of the correct style of end exhaust pipe, two frames for the front hatch upper hull openings, a couple of pieces of spare track and two nice sized pyrene fire extinguishers, what looks like a small square seat, flag holder, a front section of replacement armour and a blocking plate for the MG opening, and a rear extra fuel tank and support brackets. ITA provide an excellent sheet of decals from their 35056 D set: Churchill Decals Part I. The only one applicable is for the MK I CS tank BUSHMILLS but that leaves a nice selection for other builds. There were a number of errors on the original decal run and these have been corrected and replacements provided on an additional sheet along with suitable instructions. I was very impressed with the effort that has gone into trying to ensure that the decals are correct. To round off the Inside the Armour parts is a small sheet of PE with grills for the air intakes and fine PE for the front sections of the inside front fender. This is the standard fret suitable for all Churchills and provides wing nuts and clamps for the tools, claps for the spare track. The AFV Club PE fret is also in the kit so that covers hatch handles and levers etc. This combined kit format is a new direction for Inside the Armour. Labelled the Ultimate Edition these sets are designed to provide all the necessary parts for a specific build through a combination of Inside the Armour and AFV Club parts. Inside the Armour are changing their instructions for the MkI/II kits, the MkIcs and the Oke. All will now be like the set shown here ie covering the full assembly in one set of instructions. The level of detail on the conversion parts is very good and by combining all the elements in one box this format should appeal to modellers. It would be nice if the 3 inch howitzer barrels could be produced in metal/brass. Overall this is a very pleasing format; an Inside the Armour Conversion set, an excellent looking set of Inside the Armour decals and appropriate PE frets to correct/enhance the detail of your build plus an AFV Club Churchill Mk III, less decals, turret and barrel and their fine looking Heavy Duty Tracks Set. Although the MK I CS was only produced in small numbers this kit offers modellers a very unusual option to build and if you’ve got the Churchill bug then it will make a fine addition to any collection you may have or look equally well set in a diorama. Normal precautions when working with resin apply an reference is made to same in the instructions. I have included a few additional pictures at the bottom of the review with most of the conversion parts cleaned up for better viewing and as you will see a start has been made on the quirky but very British early turret. I have also attached a picture of the built kit borrowed from Inside the Armour for reference. I think the Panzer III cupola makes this version even more interesting. "Contact them immediately if you discover a fault, or if parts are missing, for free replacement of the part"
Lows: Some over spill from the casting of the idler wheels and around the base of the turret. Great review Al, looks like a "must get" kit. Have ITA changed the idler for this version with the heavy cast track or is the same as before? The tooth spacing is different between the two types of track so the standard AFV Club idler doesn't quite fit the heavy track properly.